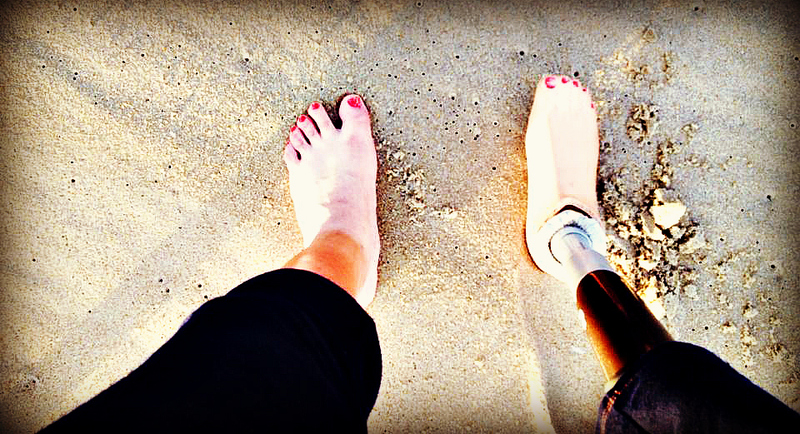 When someone is getting a new prosthetic device customized (especially at a hip-level) there are a few weeks of trial and error where the patient wears the new leg out and about while taking notes about any discomfort. As time goes on the prosthetist may stick a pad in here or trim a little from the leg there; whatever it takes to allow maximum comfort and optimum functionality. It was during this time frame of testing out a new leg that this story takes place. You see, taking up a few hours of my doctor’s time one Friday there was one simple fix we didn’t have time to squeeze in. He loosely glued and stuck a foam pad into the area that the leg was pinching me and sent me out the door so that I could test it out before making it permanent. Of course there was no problem with the pad (or pinching) when I was home alone and no one was in sight. Instead, I was at a picnic to celebrate the gender reveal of our (now) goddaughter that wardrobe malfunction struck. Innocently standing in line waiting for another drink of water in the heat of the sun I turned to make conversation with the three big and young guys standing behind me. Just as I turned I heard a light “plop”. Oh yes, it was “the pad”. It fell straight out the bottom of my cute picnic dress and laid there staring up at me and these young strangers from between my feet like the white nightmare that it was. I looked down horrified as my mind quickly pondered the best course of action to take. Do I pick it up and show it to them, explaining what it is? How do I explain “the pad” is really something that belongs to my fake leg?! Do I ignore it and pretend this never happened? Their horrified and curled up lips silently revealed that road would not be the least bumpy to take. I mean really. What could I say in this situation that would be remotely believable! What would you think if you were standing there and the lady in front of you had a white pad fall out of the bottom of her dress? Not knowing how to react and cursing the fact there is no “leg malfunction etiquette” manual for amputees I simply bent over mumbling an “oops” and busted out laughing as I realized how screwed my reputation was from there forward. Even in my laughter I must confess to making an immediate beeline for my husband just to make it clear to those young fellas that no matter how disgusting they perceived me I was loved by SOMEONE! #1. Have your Prosthetist Paste in All PADS! That is funny. Remind me not to ever tell you about my most embarrassing moment at McDonald’s.